Please see the previous article at http://ponnadi.blogspot.in/2014/02/virodhi-pariharangal-13.html. sravaNam means listening/hearing. In this section, what to be heard and what not to be heard are explained. 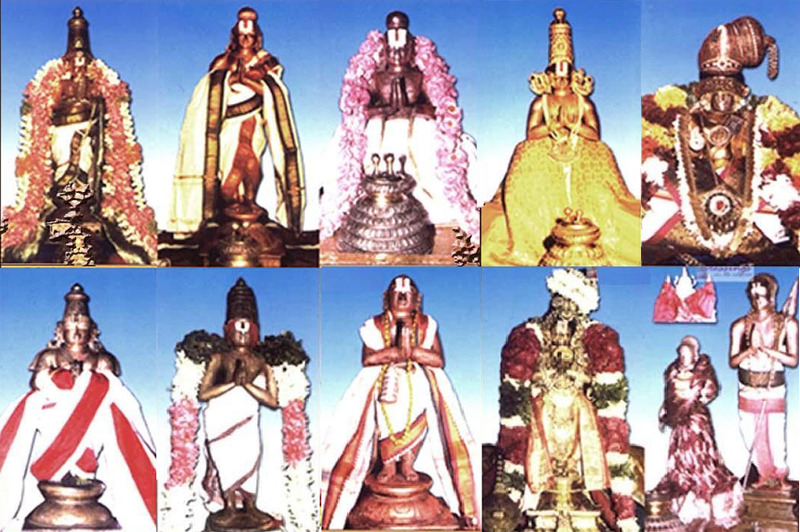 Translator's note: In srI bhAgavatham, prahlAdhAzhwAn explains that there are 9 processes of bhakthi - sravaNam kIrthanam vishNO: smaraNam pAdha sEvanam archanam vandhanam dhAsyam sakhyam Athma nivEdhanam (ச்ரவணம் கீர்த்தனம் விஷ்ணோ: ஸ்மரணம் பாத ஸேவநம் அர்ச்சநம் வந்தநம் தாஸ்யம் ஸக்யம் ஆத்ம நிவேதநம்) - Hearing, singing, remembering srIman nArAyaNan, serving his lotus feet, worshipping him, glorifying him, serving him, befriending him and offering oneself to him are the nine ways to engage in devotion towards emperumAn. Of these, sravaNam is highlighted first as it is the most important aspect. Let us see about that now. Gossiping where bhagavath vishayam is discussed, should be condemned. Not doing so is an obstacle. Though, if one is fully situated in bhagavath vishayam (matters relating to emperumAn), whatever they speak will naturally become bhagavath vishayam. In gyAna sAram pAsuram 40, it is said that "anbar chollumavidu churuthiyAm" (அன்பர் சொல்லுமவிடு சுருதியாம்) - Even casual talks of bhagavAn's dear devotees who are fully realized, will become pramANam (authentic). Translator's note: In varavaramuni uththara dhinacharyai, eRumbi appA prays to mAmunigaL that "Dear swamy! please bless me that all my thoughts are focussed on you, all my words are in glorification of you, all my acts of my body are in service/glorification for you, anything I have not mentioned here - let all of that be done for your joy" - this is the state of true srIvaishNavas - they always look out for the pleasure of emperumAn and Acharyan - so whatever they do naturally becomes pleasing to emperumAn and AchAryan. Not having full concentration on the subject matter while hearing is an obstacle. Mind should be fully focussed on the particular subject matter. It should not be heard casually and to say that "I also listened to bhagavath vishayam" without understanding the full importance. While listening to bhagavath vishayam, focussing on something else is a great hurdle. When hearing about a particular topic which one is not familiar with, one should carefully listen to the same and try to understand it properly. One should not simply nod the head and say "Yes, that is correct", etc and pretend that it is already known. When a learned scholar is explaining some principles nicely, one should not boast ones own knowledge and interrupt to show off the same. It is also not proper to find faults in what is being explained properly. Being jealous on hearing some one explaining bhagavath visahayam nicely is an obstacle. One should not show ones jealousy on seeing others shine in bhagavath vishayam. Translator's note: In Arthi prabhandham, mAmunigaL speaks about himself in pAsuram 55 "piRar minukkam poRAmai illAp perumaiyum peRROmE" (பிறர் மினுக்கம் பொறாமை இல்லாப் பெருமையும் பெற்றோமே) - I have no jealousy absolutely when seeing others shine. This is a great quality and indeed very difficult to achieve - but this is what is desired from srIvaishNavas - one must feel naturally happy about other srIvaishNavas being glorified. Not appreciating when hearing good words of bhagavath vishayam is an obstacle. It is good to be courteous and appreciate others whole heartedly when some good words are said and good deeds are done. Being jealous of sabrahmachAris (class-mates) who are more intelligent than oneself and manifesting such jealousy are great hurdles. Translator's note: A srIvaishNava should naturally feel joy when seeing other srIvaishNavas shine and feel sorrow when other srIvaishNavas suffer. This is the true quality of a realized person. It is said that when good things happen to other srIvaishNavas we should be joyful as if some good things happened to our own children (naturally every one will be delighted to see their children shine and be happy). Ones heart should melt on hearing bhagavAn's divine attributes such as saulabhyam (easy accessibility), sausIlyam (mixing freely with all), etc. Not doing so is an obstacle. We can recollect nammAzhwAr losing conscious for 6 months after remembering the supreme lord in the form of kaNNan emperumAn being in a helpless state after being bound to the mortar. bhagavath vishayam (matters relating to emperumAn) should be heart with great devotion. Hearing them casually devoid of any devotion is an obstacle. Not having bodily changes out of divine emotions is an obstacle. "AhlAdhasItha nEthrAmbu: pulakIkrutha gAthravAn" (ஆஹ்லாதசீத நேத்ராம்பு: புலகீக்ருத காத்ரவாந்) - With tears of joy and bodily changes out of emotions (goose bumps, hair standing erect, etc) when hearing the names of emperumAn. Translator's note: These aspects are explained by bhagavAn himself in garuda purANam while explaining the eight qualities of his bhaktha - one such quality is having divine emotions while hearing about him. He says "My bhakthas essentially have the following eight qualities - 1) unconditional love for bhakthas of emperumAn, 2) enjoying (others) worship of emperumAn, 3) worshipping emperumAn him/herself, 4) being without any pride, 5) having attachment in listening about emperumAn, 6) having bodily changes (like goose bumps, etc) when hearing/thinking/speaking about emperumAn, 7) always thinking about emperumAn, 8) not asking material benefits in return for worshipping emperumAn. Such bhakthas even if they are mlEchchas, they are worshippable at par with my own self by leaders of brAhmaNas, the meditators, the ones involved in kainkaryam and even sannyAsis and scholars. They are also eligible to give and accept knowledge from such scholars". After hearing the principles of our sath sampradhAyam, one should follow it fully. Not doing so is an obstacle. In nAchiyAr thirumozhi, ANdAL nAchiyAr says in 11.10 "meymmaip peruvArththai vittuchiththar kEttiruppar" (மெய்ம்மைப் பெருவார்த்தை விட்டுசித்தர் கேட்டிருப்பர்) - periyAzhwAr (my father) heard the charama slOkam and lived exactly according to that. This is Asthika lakshaNam (the real meaning of being a believer of sAsthram). Not following the principles is truly damaging to the true nature of the self. Not hearing from a sadhAchAryan (true AchAryan) is an obstacle. sadhAchAryan means the one who heard from elders (authentic AchAryas) properly, contemplate on the meanings and explain the same to others. One who learns the etiquette of our pUrvAchAryas. Only such great personalities are called sadhAchAryan. This is what mAmunigaL explains in upadhEsa rathina mAlai pAsuram 61 as "gyAnam anushtAnam ivai nanRAgavE udaiyanAna guru" (ஞானம் அனுஷ்டானம் இவை நன்றாகவே உடையனான குரு) - the AchAryan who is properly situated in knowledge as well as following the principles effectively. After learning valuable knowledge from sadhAchAryan, teaching the same to unqualified persons is an obstacle. The real qualification is the desire to learn and having faith in such true knowledge. Hearing bhagavath vishayam from avaishNavas is an obstacle. avaishNavas mean one who have dhEvathAnthara sambandham - relationship with other dhEvathAs like rudhran, dhurgA, brahmA, indhran, skandhan, etc. Translator's note: thirumangai AzhwAr explains in periya thirumozhi that we should not have any relationship with persons who are associated with dhEvathAntharams. periya thirumozhi - 8.10.3 - maRRumOr dheyvam uLadhenRu iruppArOdu uRRilEn (மற்றுமோர் தெய்வம் உளதென்று இருப்பாரோடு உற்றிலேன்) - I will not associate with the ones who accept other dhEvathAs. Such persons, even if they present bhagavath vishayam, there may be a tinge of their personal interests related to their favourite dhEvathAs - thus it is better to avoid hearing from them. Whether it is bhAhyas (persons outside vaidhIka system) or kudhrushtis (persons who accept vaidhIka system but misinterpret the meanings) - whatever they explain will always be contrary to sath sampradhAyam principles - so one have to be careful with such persons and not hear from them. One should not hear anything outside the sath sampradhAyam matters. One should hear from scholars who are properly trained in sath sampradhAyam only. Translator's note: Similar to previous point - when we hear from scholars who are not trained in the proper principles, there may be room for confusion and mis-representation of the real principles. Thus it is better to avoid such persons. In thirumAlai 7th pAsuram thoNdaradippodi AzhwAr says "kalaiyaRak kaRRa mAnthar kANbarO kEtparO thAm" (கலையறக் கற்ற மாந்தர் காண்பரோ கேட்பரோ தாம்) - will the well learned persons listen to other avaidhIka (non-vEdhic) matters. In the vyAkyAnam periyavAchAn piLLai highlights an incident where kUrathAzhwAn in his young age hears some budhist text and returns home late. kUrathAzhwAr (AzhwAn's father) becomes upset with such behaviour, gives him srIpAdha thIrtham to purify AzhwAn and then only accepts him inside the home. When hearing about the glories of bhagavAn and bhAgavathas one should feel blissful. Similary when some one insults bhagavAn and bhAgavathas (like sisupAlan did) one should at once close the ears and leave the place. Not doing so is an obstacle. charamArththam (Ultimate principles) such as thirumanthram, dhvayam and charama slOkam should be well understood and implemented in daily life. charamArththam can also mean charama slOkam. Translator's note: charamArththam can also mean ultimately accepting AchAryan as the means and goal. aruLALa perumAL emperumAnAr explains the same principle in gyAna sAram and pramEya sAram prabhandhams. In srIvachana bhUshaNa dhivya sAsthram, piLLai lOkAchAryar concluded that AchArya's mercy is the ultimate means to uplift us. viLAnchOlai piLLai explained the same principle in his saptha kAthai in 7 pAsurams. mAmunigaL explained the same principle in an elegant manner in the end of upadhEsa rathina mAlai. While discussing bhagavath vishayam one should not bring in matters relating to other dhEvathas such as rudhran, brahmA, indhran, etc. Please see the previous article at http://ponnadi.blogspot.in/2014/02/virodhi-pariharangal-12.html. sankIrthanam means singing or speaking or reciting. It generally refers to vAchika (words) kainkaryam (Translator's note: kainkaryam can be done through mind, words/speech and body). Speaking bhagavAn's supremacy while discussing his simplicity is an obstacle. guNa kIrthanam - remebering emperumAn's glorious attributes and speaking about the same. emperumAn has 2 unique qualities (which no one else has) - full in auspicious qualities and devoid of inauspicious qualities. Of the auspicious qualities, there are 2 categories - those qualities that focus on bhagavAn's parathvam (supremacy) and those qualities that focus on bhagavAn's saulabhyam (simplicity). We can recollect nammAzhwAr's thiruvAimozhi pAsuram 1.3.4 "yArumOr nilaimaiyanena aRivariya emperumAn yArumOr nilaimaiyanena aRiveLiya emperumAn" (யாருமோர் நிலைமையனென அறிவரிய எம்பெருமான் யாருமோர் நிலைமையனென அறிவெளிய எம்பெருமான்) - emperumAn remains such that he (his parathvam (supremacy)) cannot be comprehended easily and he (his saulabhyam (simplicity)) can be easily comprehended. There is no upper limit for his supremacy and there is no lower limit for his simplicity (i.e., he makes himself available very easily for his devotees). His simplicity can be seen in two of his attributes: saulabhyam (easy accessibility/approachability) and sausIlyam (mixing freely with others disregarding his supremacy). Though he descends into various incarnations with all his auspicious and supreme qualities, he shines radiantly due to his simplicity. It is this simplicity which melts the hearts of his devotees. nammAzhwAr says "eLivarumiyalvinan" (எளிவருமியல்வினன் - naturally simple) in thiruvAimozhi 1.3.2. In thiruvAimozhi 1.3.1, AzhwAr remembers krishNan being bound by yasOdhA for stealing butter saying "eththiRam! uralinOdu iNainthirunthu Engiya eLivE!" (How is it possible? what simplicity in being bound to the mortar and manifesting helpless nature (even after being the supreme)?) and faints for a long period as explained in history. In thiruppAvai, ANdAL nAchiyAr explains that gOvindhan (cow herd - one who tends the cows) is the biggest and dearest name for krishNan (which explains his simplicity). The name "nArAyaNan" (which speaks about his supremacy) is said to be a small name. The gOpis say "chiRupErazhaiththanavum chIRi aruLAthE em iRaivA" (சிறுபேரழைத்தனவும் சீறி அருளாதே எம் இறைவா) - Dear Lord! If we call you by your small name, please do not become angry on us. guNavAn (One of the qualities explained for srI rAma in srI rAmAyaNam by vAlmIkI) explains srI rAma as the one with abundance of saulabhyam (easy accessibility) and sausIlyam (mixing freely with everyone). Thus, while speaking about the qualities that are focussed on simplicity, one should not discuss his supremacy - that is never desirable. bhagavAn should be glorified as svayam prayOjanam (glorifying emperumAn in itself is the goal - it is not done expecting something from bhagavAn in return). Glorifying bhagavAn to receive some wealth, benefit or fame is an obstacle. bhagavAn's auspicious qualities are to be sung/spoken in a blissful manner for both the speaker and listener. Glorifying incomplete/defective personalities is an obstacle. This is to be understood as instructing us to avoid dhEvathAntharams. Translator's note: emperumAn is explained as the abode of all auspicious qualities and directly opposite to inauspicious qualities. srIvaishNavas who are fully devoted to bhagavAn and bhAgavathas are also fully eligible for our glorification. But other dhEvathas such as rudhran, brahmA, indhran, skandhan, dhurgA, etc., are all bound souls in this samsAram. While they are empowered by bhagavAn to perform certain aspects in this samsAram, they are still limited in so many ways and are in the modes of rajas (passion) and thamas (ignorance) many times. So, they dont truly deserve to be glorified by srIvaishNavas. Disregarding glorification of bhagavAn citing that the language is not samskritham. bhagavAn can be glorified in any language. Translator's note: samskritham is hailed as dhEva bhAshA (divine language). vEdham is in samskritham language and is full of glorification for emperumAn. But in many other languages there are many literature that glorify emperumAn. azhagiya maNavALa perumAL nAyanAr (the divine brother of piLLai lOkAchAryar) compiled a wonderful prabhandham (prose) named AchArya hrudhayam which is a collection of sUthrams in thamizh. In this prabhandam, he establishes that, irrespective of their birth, AzhwArs' glories are unlimited because they were directly blessed by emperumAn and thus were fully surrendered to him; irrespective of the language in which they are written (thamizh), 4000 dhivya prabhandhams are glorious since they are the essence of four vEdhams and fully glorify emperumAn alone. Thus he establishes the glories of AzhwArs and their dhivya prabhandhams and prove that they are to be pursued fully by srIvaishNavas. Glorifying other materially minded persons (who may be wealthy, politically powerful, etc) and dhEvathAntharams with the tongue/mouth that is given specifically to glorify emperumAn in an obstacle. nammAzhwAr says in thiruvAimozhi 3.9.1 "ennAvil inkavi yAn oruvarkkum kodukkilEn, ennappan emperumAn uLanAgavE" (என்னாவில் இன்கவி யான் ஒருவர்க்கும் கொடுக்கிலேன், என்னப்பன் எம்பெருமான் உளனாகவே) - my tongue will not glorify any one other than emperumAn who sustains himself by hearing my sweet glorification. After becoming a srIvaishNava (with proper understanding of sath sampradhAyam principles), reciting pAsurams that are not written by AzhwArs and AchAryas is an obstacle. Translator's note: AzhwArs were divinely blessed with blemishless knowledge by emperumAn. Our purvAchAryas were divinely blessed by AzhwArs. Whatever written by them are totally pure without any self-motivation. So, we strictly recite and follow what is written by our AzhwArs and AchAryas. In case of other persons (even devotees of emperumAn but not following our sudhdha sampradhAya AchArya paramparai), depending on their own nishtai and understanding, there may be mix of upAyAntharam (considering karma, gyAna, bhakthi, etc., as upAyam), prayOjanAntharam (looking for benefits other selfless kainkaryam to srIman nArAyaNan) and dhEvathAntharam (independent glorification of other dhEvathas). Thus, it is better to avoid such literature as we ourselves may not fully be able to distinguish between pure and mixed literature. Such literature of AzhwArs and AchAryas should be learnt under a proper AchAryan. Learning it on our own by studying them independently or learning it through un-authorized persons is an obstacle. bhagavAn's nAma sankIrthanam must be done joyfully not just as a purificatory process. Doing so is an obstacle. Reciting bhagavAn's name leads to pure bliss. madhurakavi AzhwAr says in kaNNinuN chiRu thAmbu 1 "kurugUr nambi enRakkAl aNNikkum amudhURum ennAvukkE" (குருகூர் நம்பி என்றக்கால் அண்ணிக்கும் அமுதூறும் என்னாவுக்கே) - when I recite nammAzhwAr's name, I can taste pure nectar in my tongue. nammAzhwAr says in thiruvAimozhi 7.9.11 "enganE sollilum inbam payakkumE" (எங்ஙனே சொல்லிலும் இன்பம் பயக்குமே) - however I say emperumAn's glories, it leads to bliss. Translator's note: thoNdaradippodi AzhwAr brings out the full glories of nAma sankIrthanam in his thirumAlai. periyavAchAn piLLai brings out the wonderful meanings of this prabhandham in his detailed vyAkyAnam (commentary). In the first pAsuram, nAma sankIrthanam's pAvanathvam (its own purity and ability to purify the reciter) is highlighted. In the second pAsuram, the bhOgyathvam (sweet and most enjoyable nature) of nAma sankIrthanam is highlighted. Both aspects are important. periyavAchAn piLLai beautifully explains the reason for presenting pAvanathvam (purity) before bhOgyathvam (bliss) - that is, once we are purified by nAma sankIrthanam we can feel the full bliss properly. Independently reciting bhagavAn's names without reciting bhAgavathas names is an obstacle. Both bhagavan nAma sankIrthanam and bhAgavatha nAma sankIrthanam are equally glorious (infact bhAgavatha nAma sankIrthanam - glorifying bhAgavathas is even greater). So, both should be done. We can recollect the verse from previous point - madhurakavi AzhwAr says in kaNNinuN chiRu thAmbu 1 "kurugUr nambi enRakkAl aNNikkum amudhURum ennAvukkE" (குருகூர் நம்பி என்றக்கால் அண்ணிக்கும் அமுதூறும் என்னாவுக்கே) - when I recite nammAzhwAr's name, I can taste pure nectar in my tongue. Independently starting to recite/speak in front of the AchAryan without receiving his approval and not reciting when he orders to do so are obstacles. Translator's note: piLLai lOkAchAryar explains in the end of his "arththa panchakam" that a srIvaishNava (who has understood the five essential principles) should manifest certain qualities in front of certain personalities. In that, he says, in front of bhagavAn one should manifest humility/meekness, in front of AchAryan one should manifest ignorance (i.e., wanting to learn everything from him instead of showing off ones own intelligence) and in front of materially minded persons one should manifest that the distinct nature (that one is a srIvaishNava) from them. Also, AchAryas will feel great pleasure, when they see their sishyas speak about bhagavath/bhAgavatha vishayam - so when the AchArya instructs one to speak one should not refuse at that time - one should humbly speak the glories of bhagavAn and bhAgavathas at that time. When in gOshti (collective/congregational recital), independently starting to recite is an obstacle. Usually, there will be a leader for the gOshti who first starts with "sAthiththaruLa" (ஸாதித்தருள) meaning - kindly begin the recital. Only after that, we should start reciting. This is the proper etiquette. Not reciting subsequent part after the leader starts recital is an obstacle. Translator's note: Out of ego, one may always want to show that he is the leader and he only begins the recital. Such persons, may keep their mouth shut in gOshti when some one else leads. This is not at all good etiquette (behaviour). Hesitating to recite the second part of pAsurams. Translator's note: In gOshti, usually, learned/senior adhyApakas recite the first part of the pAsuram and others (juniors, etc) recite the second part of the pAsuram. This method allows seamless recitation and facilitates proper rest between recitals so that recitals can be done for long durations. This is the standard practice in dhivya prabhandha sEvAkAlam (recital). Given a situation, any one should be ready to recite the second part without any hesitation. Reciting in such a fast manner that some letters/words are missed is an obstacle. Translator's note: dhivya prabhandham must be recited in a reasonable pace, so that every one can follow, recite and understand what is being recited. It should not be done so fast that words are missed, etc., to fit ones own convenience and urgency. When a srIvaishNava in the gOshti recites something wrongly, he should not be laughed at and made fun of. Nor that person should be corrected publicly. Privately he may be informed humbly about the misses. First and last pAsurams of each prabhandham and each padhigam (decads) are recited twice. Not doing so is an obstacle. There are some exceptions (Translator's note: such as recitals during charama kainkaryams - final rites, etc - all pAsurams are recited only once) - please enquire from elders for further details. Not performing anjali (namaskAram - salutations with joined hands) when hearing sadagOpan is an obstacle. During the last pAsuram of the prabhandham/padhigam, nammAzhwAr's name is usually recited (as part of the pAsuram). At that time, it is customary that we turn towards south direction (AzhwAr thirunagari is located in deep south of bhAratha dhEsam) and perform an anjali. Translator's note: This is applicable for other AzhwArs too. 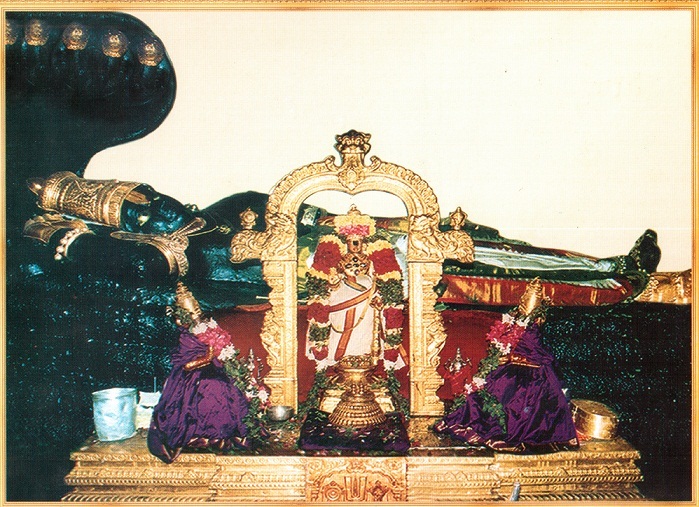 azhagiya maNavALa perumAL nAyanAr highlights this principle in kaNNinuN chiRu thAmbu vyAkyAnam as well as AchArya hrudhayam - that it is mandatory for srIvaishNavas to perform anjali towards south direction immediately on hearing nammAzhwAr's name showing our gratitude towards his great favours for us. It is a pity that, even learned persons do not perform anjali on hearing nammAzhwAr's name during sEvAkAlam. While this is said for nammAzhwAr here, the same principle can be applicable for all AzhwArs. Not performing sARRumuRai (proper completion) for dhivya prabhandham recitals is an obstacle. Whenever dhivya prabhandham is recited, there is a proper process to follow. We start with common thanians, then recite the particular prabhandhams in sequence and finally perform sARRumuRai properly according to the practice in particular temple, mutt, thirumALigai (residence), etc. Just dhivya prabhandham recital without the proper routine is not proper. When teaching dhivya prabhandham to others, one should not expect any material/monetary benefits in return. Translator's note: dhivya prabhandham is fully focussed on kainkaryam and mangaLAsAsanam for emperumAn. So, the purpose of teaching dhivya prabhandham is to induce others in performing mangaLAsAsanam to emperumAn. That is the only goal - there is no place for any other expectation in that. One should not recite dhivya prabhandham in return for money. Selling AzhwArs' dhivya prabhandhams for a price or reciting dhivya prabhandhams as a paid-job is a great sin. It is OK to accept if there was voluntary sambhAvanai (offerings) from some one for reciting dhivya prabhandham - but there should not be any demand from the reciter. One should not participate in dhivya prabhandham recitals at the homes of persons who are engaged in dhEvathAnthara worship. This will affect the svarUpam of such reciter. This is like performing nithya karmAnushtAnam at a ghat where materially minded persons take bath - it only pollutes others who are pure. It is said that, in front of a dhEvathAntharam temple, even when hearing nammAzhwAr's name, we do not need to perform anjali (since it could be mistaken for performing anjali to the dhEvathAntharam). Reciting vishNu saharanAmam, Ezhai Ethalan (thirumozhi 5.8), Azhiyezha (thiruvAimozhi 7.4) pAsurams to cure oneself from diseases is an obstacle. 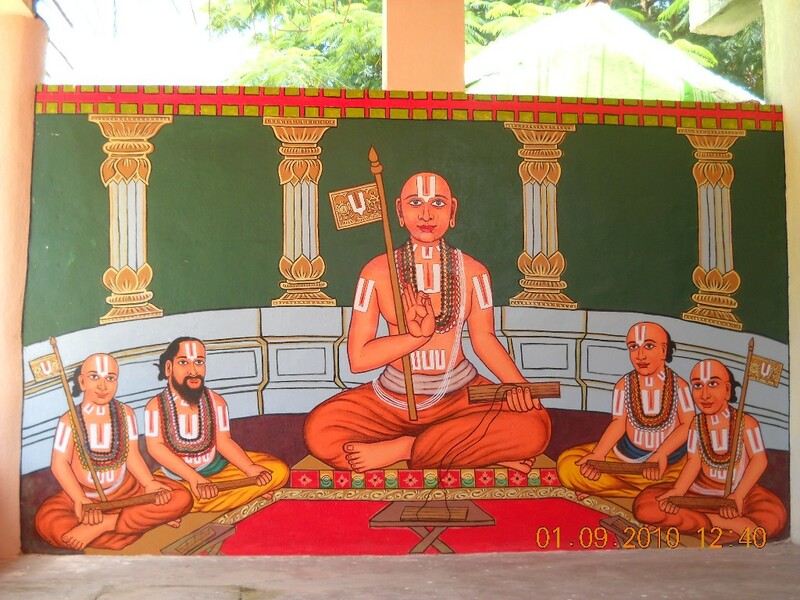 It is generally explained that reciting sahasranAmam and the pAsurams mentioned here relieve oneself from diseases. But since we should not be looking out for the body in any manner, it is improper to recite this to cure ourselves. It may be OK to recite to cure others. Reciting glories of bhagavAn without reciting glories of AchAryan is an obstacle. Usually thanians are recited before reciting the prabhandhams. We can recollect mudhaliyANdAn's declaration "Reciting dhvayam without guruparamparA manthram is similar to worshipping dhEvathAntharams". 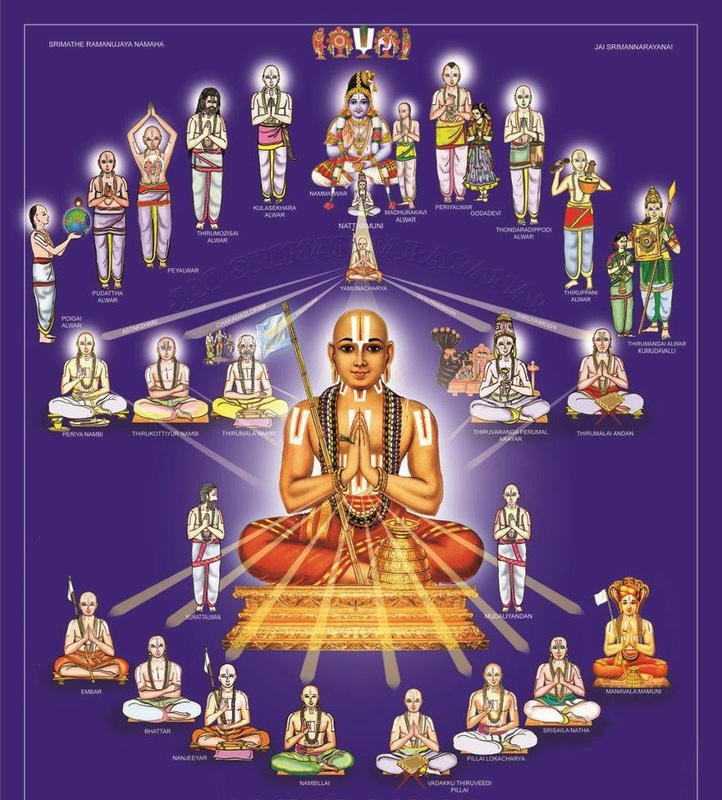 Translator's note: We can observe in many pUrvAchArya sthOthra granthams such ALavandhAr's sthOthra rathnam, AzhwAn's sthavams, bhattar's srI rangarAja sthavam, etc., first several slOkams glorify guru paramparai, AzhwArs and AchAryas and subsequently the actual sthOthram will begin. piLLai lOkAchAryar highlights the same principle in srIvachana bhUshaNa dhivya sAsthram sUthram 274 "japthavyam guru paramparaiyum dhvayamum" (ஜப்தவ்யம் குரு பரம்பரையும் த்வயமும்) - one should constantly recite guru paramparA manthram (asmath gurubhyO nama:....srIdharyAya nama:) and dhvaya mahA manthram - mAmunigaL in his commentary explains that guru paramparai means starting from ones own AchAryan upto srIman nArAyaNan (who is the first AchAryan for every one) and dhvayam is the prasAdham of such guruparamparai received from ones own AchAryan.